Cet ancien pressoir normand du XVIIIème siècle a été rénové par un architecte en 2008 avec piscine chauffée et cuisine d'été avec plancha. Une décoration raffinée avec un mélange de colombages, de contemporain et de mobilier design. Idéalement situé et très calme pour des vacances à la campagne inoubliables. Idéal pour un week-end / vacances entre amis ou en famille. Nous ferons tout notre possible pour que vous passiez les vacances les plus agréables. 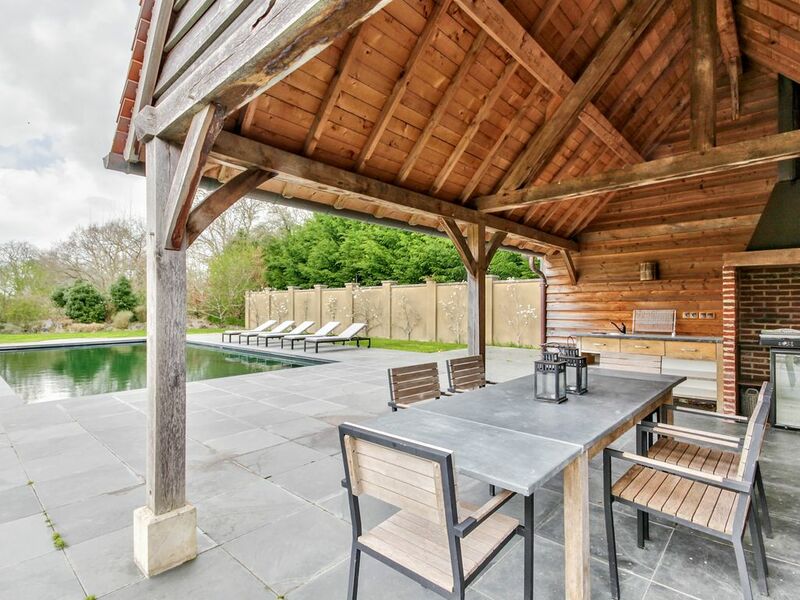 The pictures of this property really don't do it justice, when the sun is shining the whole place is idyllic. We went as a family of 8, 2 adults and 6 teenagers and found the huge space perfect, the only thing I would say is that it advertises sleeping 12, which I guess it does at a push, but I would say more comfortably 8 and then the extra 2 in the pool house if necessary, which is quite small, but very comfortable & quiet, the reason I say this is because there are only two loo's so sometimes a queue would form in the mornings but we dealt with it fine and it wouldn't put us off going back , the house is very well equipped with pretty much everything you would need and it's near to some lovely towns, HonFleur being one of them, the grounds are massive and we basically had a perfect holiday, would definitely re visit if we could guarantee good weather again, many thanks Magali & Barbara. The house is absolutely beautiful. The design is perfect: new and old combined, functional and beautiful at the same time. Lots of windows, the outside is inside and the inside is outside. Big bedrooms, more then enough space to host 2 families with kids. It was very clean, great pool, and easy to get in contact with the owners in case there are questions. We had a great time, and would love to come back!